Prosecutors raided additional offices of Lotte Group’s policy headquarters Thursday in order to gain evidence regarding alleged tax evasion by group founder Shin Kyuk-ho, officials said Friday. Shin is now suspected of evading roughly 600 billion won ($540 million) of gift taxes while transferring assets to his common-law wife Seo Mi-kyung and their daughter Shin Yoo-mi. Prosecutors have collected preliminary evidence from a law firm that counseled Shin during the 2005 transfer, which included 6 percent of Shin Kyuk-ho’s shares in Lotte Holdings. For now, the group has neither confirmed nor denied the allegations. The investigators suspect that Shin and his family were able to avoid paying taxes on the transfer by funneling the transaction through multiple paper companies in the U.S., Hong Kong and Singapore. Lotte Holdings is the holding company of Lotte‘s operations in both Korea and Japan. Prosecutors received relevant documents from the law firm on Monday, and questioned lawyers and accountants with the firm. Seo and her daughter are expected to be called in for questioning once prosecutors complete analysis of the obtained documents. The two women have already been implicated in other allegations against Lotte Group, including making illicit real estate transactions and receiving special favors in operating concession stands at Lotte Cinema, the group’s movie theater chain. Meanwhile, prosecutors are pursuing leads on illegal lobbying by the group‘s home shopping network Lotte Home Shopping in order to be relicensed for operations. 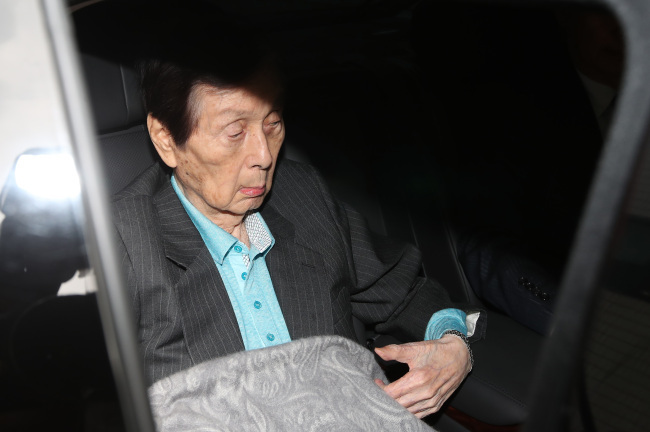 Lotte Home Shopping is accused of attempting to bribe officials in order to bury information that would hurt their chances of gaining an extended license. One member of the licensing panel was also discovered to have hidden the fact that he had received approximately 50 million won in consultation fees from Lotte in the past. While facing various suspicions from prosecutors, Shin Kyuk-ho is also awaiting a court ruling on his need for an adult guardian. Shin’s younger sister Shin Jeong-sook filed a petition last December claiming that founder Shin’s deteriorating physical and mental health prevented him from sound judgment, and requested an adult guardian for him. The court ruling, expected to come Aug. 10, will have a large impact on the fight between brothers Shin Dong-joo and Shin Dong-bin over control of the group. Elder brother Shin Dong-joo has claimed that he is the legitimate heir of Lotte Group because founder Shin had named him successor. However, if on Aug. 10 a court rules that Shin Kyuk-ho is not of sound mind, Shin Dong-joo will lose his strongest argument against his brother, current Lotte chairman Shin Dong-bin.